May 3 marked the twentieth anniversary of UNESCO’s World Press Freedom Day. A day to celebrate press freedom around the world. Or the lack of it. 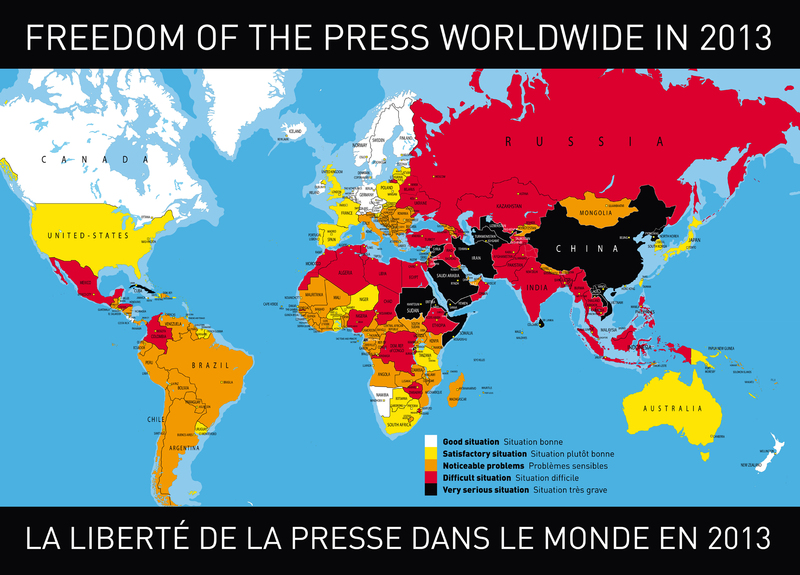 Reporters Without Borders has released its annual report on world press freedom in 2013, which documents overall trends and has a region-by-region breakdown of key issues and developments. This year already, nineteen journalists have been killed and 174 imprisoned, and 9 citizen journalists have been killed and 162 imprisoned. Finland, the Netherlands, Norway, Luxembourg, and Andorra are ranked as the countries that most respect media freedom, while Eritrea, North Korea, Turkmenistan, Syria, and Somalia are the countries that least respect it. In Somalia (175th, -11) 18 journalists were killed, caught up in bomb attacks or the direct targets of murder, making 2012 the deadliest in history for the country’s media. The Horn of Africa state was the second most dangerous country in the world for those working in news and information, behind Syria. In Eritrea (in last place in the index for the sixth successive year), no journalists were killed but some were left to die, which amounts to the same thing. With at least 30 behind bars, it is Africa’s biggest prison for journalists. Of 11 incarcerated since 2001, 7 have died as a result of prison conditions or have killed themselves. Since the independent media were abolished more than 10 years ago, there are no independent Eritrean news outlets, other than outside the country, and terror prevails. East Africa is also a region of censorship and crackdowns. Omar al-Bashir’s Sudan, where more newspapers were seized and the arrests of journalists continued during the summer, is stuck firmly in 170th place, in the bottom 10 of the index. Djibouti (167th, -8), which has no independent media, detained a correspondent of the foreign-based news site La Voix de Djibouti. Despite the release of two Swedish journalists arrested in 2011, Ethiopia (137th) fell ten places because of its repressive application of the 2009 anti-terrorist law and the continued detention of several local journalists. Mali (99th, -74), which was long presented as the continent’s star performer in democracy and press freedom, was prey to the political events that overtook it during the year. The military coup in Bamako on 22 March and the seizure of the north of the country by Touareg separatists and Islamic fundamentalists exposed news organizations to censorship and abuses. Many northern radio stations stopped broadcasting, while in the capital several Malian and foreign journalists were assaulted. All these occurred before the external military intervention in January 2013. The Central African Republic was ranked 65th in 2012. Events after the outbreak of the Seleka rebellion at the very end of the year (radio stations ransacked, one journalist killed) were not taken into consideration in this index, thus preventing the country from falling more than 50 places. These will be included in the 2014 version. In Guinea-Bissau (92nd, -17) a media blackout and military censorship that followed the coup on 12 April explain that country’s drop. Yahya Jammeh, King Mswati III, Paul Kagame, and Teodoro Obiang Nguema, together with other heads of state such as Issaias Afeworki (Eritrea) and Ismael Omar Guelleh (Djibouti) are members of an exclusive club of authoritarian African leaders, some eccentric others stern, who hold their countries in an iron grasp and keep a firm grip on news and information. Their countries, respectively Gambia (152nd), Swaziland(155th), Rwanda (161st) and Equatorial Guinea (166th), are all among the bottom 30 in the index. Media pluralism has been whittled away and criticism of the head of state discouraged. Chad (121st, -18) saw journalists harassed and roughed up, the publication of the newspaper N’Djamena Bi-Hebdo temporarily halted and its publisher sentenced to a suspended prison term, and a highly repressive bill kept under wraps. The slow but sure progress that followed the formation of a national unity government in Zimbabwe (133rd, -16) in 2009 and the granting of publication licences to several independent newspapers appeared to have stalled. Violence and arrests of journalists still niggle and if elections go ahead as planned in 2013, the atmosphere for the media promises to be tense. Relatively high placed in 2011-2012,South Sudan (124th) fell 12 places after the murder of a columnist – the first killing of its kind in the new country – as news organizations and journalists awaited the approval of three new laws on the media. Despite the holding of a national media conference in Cameroon (120th, -23), the future of the sector remains both uncertain and worrying. In the upper reaches of the index, Niger (43rd) nonetheless fell 14 places as a result of the irresponsibility of a few journalists who succumbed to the temptation to abuse the freedom that they enjoyed. Within the space of four months in Tanzania (70th, -36), one journalist was killed while he was covering a demonstration and another was found dead, a clear victim of murder. Burundi (132nd) fell only two places but remains a low position. Summonses of journalists declined but the case of Hassan Ruvakuki, given a life sentence reduced to three years on appeal, has created an atmosphere of fear among the media. After a dreadful year in 2011, marked by the dictatorial behaviour of the late President Bingu Wa Mutharika, a violent crackdown on demonstrations and the murder of the blogger Robert Chasowa, Malawi (75th) recorded the biggest jump in the entire index, up 71 places, close to the position it held in 2010. Similarly,Ivoiry Coast rose 63 places to 96th despite persistent problems. It had plummeted in the previous index because of a post-election crisis and the murders of a journalist and another media worker, as well as the civil conflict that broke out in Abidjan in April. Uganda (104th) was up 35 places thanks to a better year, but things were far from satisfactory as far as the media were concerned. The year ended with President Yoweri Museveni making open threats to several radio stations. For Senegal (59th, +16), 2012 was a year of hope. The presidential election took place in a peaceful atmosphere for the media, despite a few regrettable assaults on journalists, and President Macky Sall, who had declared himself willing to decriminalize press offences, took office. Much remains to be proved in 2013, as was illustrated by the prison sentence handed down on a journalist in December. In Liberia (97th, +13), the presidential election in November 2011 had been tainted by the closure of several media outlets and attacks on journalists. In 2012, the atmosphere improved greatly. In the summer, President Ellen Johnson Sirleaf became the second African head of state, after Mahamadou Issoufou ofNiger, to sign the Declaration of Table Mountain, thereby undertaking to promote media freedom. What really happened at Asmara’s ministry of (dis)information ? According to Reporters Without Borders, with at “least 30 behind bars [Eritrea] is Africa’s biggest prison for journalists.” Following a widespread government crackdown in 2001, there are no independent news outlets in Eritrea. Of the eleven journalists who were imprisoned in 2001, seven have already died in prison or killed themselves. The government, led by the Information Minister Ali Abdu, uses intimidation and imprisonment to maintain control information. North Korea is also one of the hardest countries for foreign journalists to cover, with access and freedom of movement severely restricted. While the internet may offer some hope for change, access is severely restricted and “independent journalists have to operate clandestinely and risk arbitrary detention or even torture.” Journalists Annakurban Amanklychev and Sapardurdy Khadzhiev, both held on fabricated charges, were only released earlier this year after seven years in prison. While privately-owned media outlets have emerged in Syria, the state “has always maintained a stranglehold on news content,” through web censorship, harassment and abuse of journalists, media blackouts on dissent, and the arrest and expulsion of foreign reporters. As we reflect on the severe restrictions that journalists in the above countries face, we must also remain critical of the state of the media in countries that are so often held up as beacons of freedom. While obviously not on the same scale as what is happening in Eritrea or Somalia, things such as the hacking scandal in Britain and the arrest of journalists covering the Occupy movement in the U.S. should also give us pause for thought.